The Main Shabbat morning Service, held in our beautiful shul, is the heart of our community. We extend a warm welcome to everyone who wishes to come along and join us on Shabbat morning. The service is under the direction of our senior rabbi, Rabbi Daniel Friedman. Tefillot (prayers) are led by Chazan Avromi Freilich whose enchanting voice and range of uplifting tunes encourages the whole congregation to join in with the communal singing. In addition we are inspired by Rabbi Friedman in his weekly Sermon when he provides food for thought in his messages for “Life in the Modern World”. Whatever your level of religious observance or cultural identity, we are confident that you will feel at home in our Shul, please come along – just find an empty seat and join in. This is a service that provides an opportunity to celebrate life and to come together as Jewish People. We endeavour to balance decorum in the shul offering a friendly atmosphere whilst respecting the dignity worthy of a place of religious worship. At the door you’ll be welcomed by a member with a smile who will offer you a siddur, chumash, and then direct you to a seat. The community is blessed with many young families and we often celebrate both a bar and a bat mitzvah on the same Shabbat. As would be expected in a United Synagogue, men and women sit separately. The men’s section is on the ground floor whilst ladies sit upstairs in the gallery. 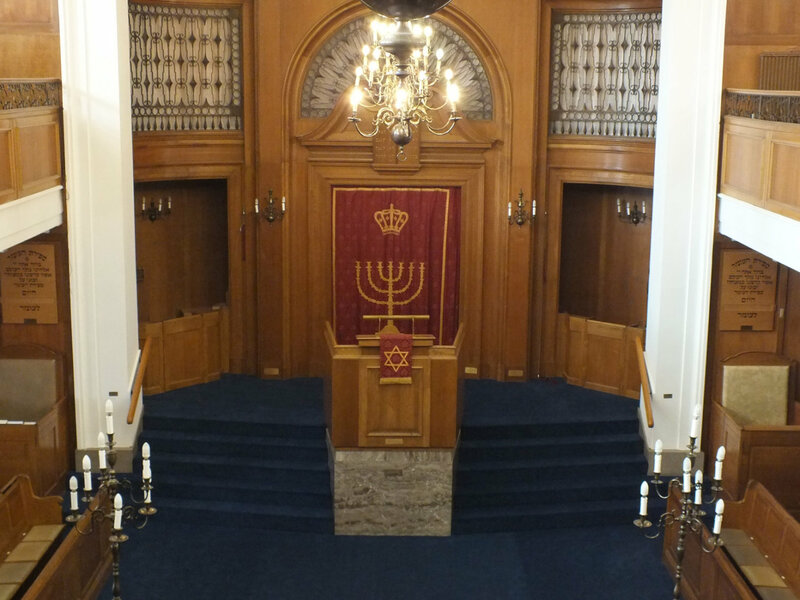 We have an induction loop system installed for the hard of hearing which is available throughout the synagogue complex and there is also lift access (including on Shabbat) to the upper floor. However there are still a few stairs to negotiate but for those ladies who may experience difficulty with these, we have a small seating section on the ground floor. Gentlemen who wish to be called up to celebrate a special occasion or to commemorate a yahrzeit, are asked to contact the Wardens or the Shul Office who will do their best to arrange for a mitzvah on the appropriate date. Of course, children are also welcome in Shul to sit with their parents and to help keep them occupied you are welcome to choose a book from the small library available in the front foyer.